Native to the Atlantic Ocean and the rivers and streams that drain into it from Newfoundland to North Carolina; Great Lakes and Finger Lakes contain landlocked populations. Adults enter the Chesapeake Bay and its tributaries in spring to spawn. Also known as the big-eye or branch herring, the alewife is a thin, silver fish with a single dark shoulder spot located behind its head. 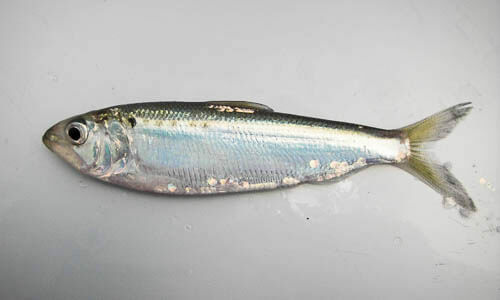 The alewife is a thin, silver fish with grayish-green back, smooth scales and large eyes. 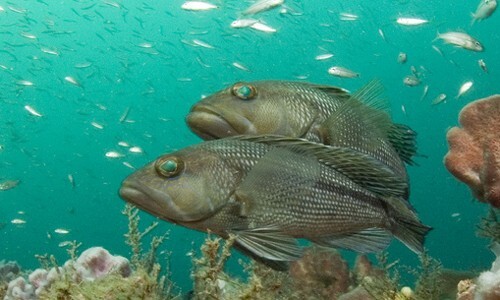 A single dark shoulder spot located behind the head appears on fish greater than 3.9 inches long. Adults grow to 15 inches and weigh less than one pound. Females are bigger than males. Schools feed in mid-water or near the surface on zooplankton, shrimp, small crustaceans, small fish, fish eggs. An anadromous fish, the alewife must migrate from the ocean into freshwater rivers, streams and ponds to spawn each spring. Females reach spawning grounds first. Older fish are the first to spawn; adults move downstream after spawning takes place. Eggs are adhesive when first laid, but soon lose stickiness and settle on substrate. Eggs hatch in three to six days. Young grow rapidly through spring and summer. While some will spend first winter in the Bay, most gradually migrate downstream before entering the ocean in the fall. Less than one percent will survive spawning season. 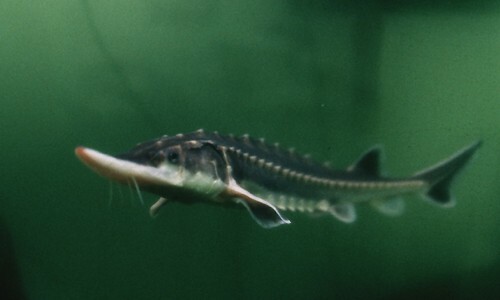 The oldest fish recorded at spawning sites were 9 to 10 years old. Alewives are packaged fresh, smoked, salted or pickled for human consumption. Alewives are also used for pet food, lobster and snow crab bait and processing into fishmeal and fish oil. The "river herring" fishery (which includes the alewife and the blueback herring) has been one of the most valuable in the Bay, with annual catches once exceeding 8 million pounds in Maryland and 30 million pounds in Virginia. The degradation and destruction of spawning habitat and the restriction of spawning migration (or fish passage) by dams have contributed to the decline of these stocks.